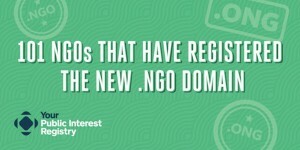 Public Interest Registry, the registry of .org .ngo and .ong among others, published a list of 101 NGOs that have registered new .NGO domain names. It hasn’t been since the release of the .ORG domain in 1985 that nonprofits, charities, and NGOs worldwide have had the opportunity to register a new domain so relevant to the nonprofit sector. Odds are that your first choice of the new .NGO domain is still available, but not for long. The new domain — which can only be registered and used by NGOs, charities, and nonprofits — is going fast! See below the list of 101 NGOs covering some of the early adopters. Italics = The NGO has registered the domain, but it is not in use yet. “↪” = The NGO has registered the domain and it is forwarding to a .ORG website. Bold = The NGO has the registered the domain and it is currently in use for web and email communications. Another pointless TLD, and a dumb move from PIR. What they are basically doing is torpedo .org. Where is George Soros and his Move On soldiers?